The Mono Pass Trail encounters a different Yosemite to the land of pine forests, vertical cliffs and granite domes that covers much of the park, as here, on the east edge of the Sierra Nevada, the hills have a more traditional appearance with smooth-sided slopes, largely barren of trees, covered by thin soil or sparse grass, reflecting the much drier conditions on the leeward side of the mountains. The path leads to a gap in the Sierra crest (Mono Pass), between 12,764 foot Mt Gibbs and 12,291 foot Mt Lewis, from where Mono Lake and the edge of the Great Basin Desert are clearly visible, some 4,000 feet below. The pass is a lonely, windswept location though still beautiful in its own way, with the added attractions of several lakes and some long-abandoned gold workings (the Golden Crown Mine). The trail is 4 miles long and gains 1,000 feet but is easy as high mountain routes go, though some people might experience problems due to the elevation. It follows part of a lengthy ancient Indian route, used for centuries by the Piute and Miwok tribes to cross the Sierra Nevada. Mono Pass topographic map, Tuolumne Meadows trails. 9 views along the Mono Pass Trail. The start point for the Mono Pass Trail is along the Tioga Road 1.4 miles from the east entrance of Yosemite National Park, in an area of thick forest; the trailhead has a sizeable parking lot though is rather less used than some of those around Tuolumne Meadows. The path descends a short distance into the trees and crosses Dana Meadows, over one main stream and a few smaller ones, through alternating patches of grassland and trees. 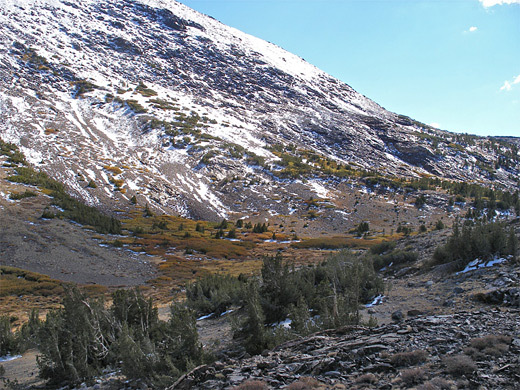 It climbs up and over several small ridges then enters the low valley of Parker Pass Creek, following above the creek though largely out of sight. The stream flows through a belt of open ground but the land around the path is mostly wooded - a well-established forest of tall pines, quite separated from each other and without any undergrowth. The surface is smooth, free of stones and boulders, the path is straight and nearly level for long stretches, so walking is very easy. 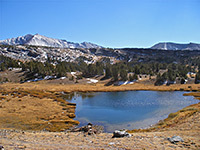 After 2.4 miles, a 2 mile spur path branches off on the right towards Spillway Lake, at the head of the creek; after this junction the Mono Pass Trail starts to climb the north side of the valley, steeply at first then less so, as the trees on the south side fade away allowing for long distance views of grassy slopes and tall peaks of the Kuna Crest. Along the path are several ruined log cabins, built by miners in the early 19th century. Just before the woodland stops completely is a second junction, the start of the Parker Pass Trail which leads southwards to the next gap in the mountains, where it exits Yosemite National Park and continues to much untamed scenery in the Ansel Adams Wilderness. 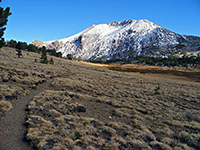 The main trail reaches Mono Pass after 10 more minutes, passing an NPS boundary sign and several lakes, the largest being Summit Lake, at 10,604 feet elevation. Apart from bushes around the lakes, the pass is surrounded on all sides by short grass meadows beneath desolate, reddish, treeless hills, and it has a real feeling of isolation. 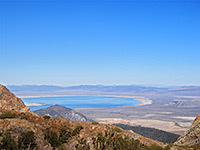 On the far side of the summit, the trail starts to descend, soon reaching Upper and Lower Sardine Lake, and the first glimpse of turquoise-blue Mono Lake, far below near the border with Nevada. From this viewpoint, after a steep, continuous descent of 3,000 feet in less than 4 miles, the path meets a forest track linking with road CA 150 near Grant Lake.